Doing traffic termination in Liberia to make money and get profits is quite real.This is evidenced by the numerous proposals from transit companies, which thematic forums are full of. They are willing to provide up to 25 thousand minutes for the termination voip in Liberia. At the same time, the average voip rates in this area are $0.28, with a minimum tariff for calls within the country. Liberia attracts terminators very much because it promises the possibility of making big money. However, before you place GSM gateways to carry out goldmodem traffic termination in the country, you must make sure that the Internet is suitable for the landing of international calls. With a population of 4.3 million people, about 5% of the total number of local residents use services of the Internet providers. Providers offer wireless internet access, as well as GPRS, EDGE, WiMAX, and HSPA mobile networks. The high cost of services has led to the unavailability of the major number of Internet services for the majority of the population. Limited bandwidth has led to a low data rate, which is below the generally accepted norm in Liberia. Nevertheless, experts predict improvement in the situation, as the country has the recently an international fiber optic submarine cable installed. Although note that this still needs significant investment. Upload Speed - 1.5 kilobits per second. The high-speed Internet can be found in the capital of the state Monrovia. Here, the average download speed is 2.1 Mbps. 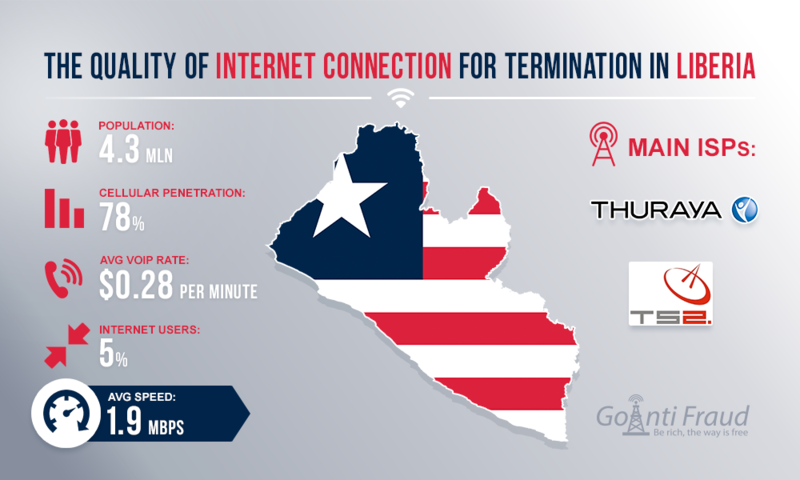 The average cost of Internet packages in Liberia is $1,000 a month. On the one hand, it is quite expensive even for the unlimited package. But with monthly earnings of about 6 thousand dollars doing termination voip, business spending on Internet connection will not be too significant. With regard to data rate, it is suitable for a small amount of equipment with multiple ports in the same location.